You’re a Certified Scrum Product Owner® (CSPO®) who’s focused on maximizing business value and Product Backlog optimization to understand how to do the best possible job to satisfy key stakeholders. Your next step in your Agile journey is to achieve your Advanced Certified Scrum Product Owner (A-CSPO℠) certification. This advanced offering is ideal for you if you’ve already had one year of experience working as a CSPO on a Scrum Team. Manage multiple business initiatives from competing stakeholders. Clearly order and express Product Backlog items. Identify the crucial opportunities and avoid wasting time. 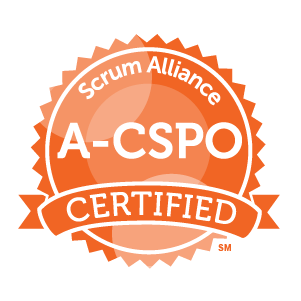 Hold an active Certified Scrum Product Owner (CSPO) certification with the Scrum Alliance. Validate at least one-year work experience specific to the role of Product Owner (within the past five years). Ready to advance your career as an Advanced Certified Scrum Product Owner? Find an offering here. If you have additional questions, please visit the FAQ page or contact support@scrumalliance.org.